Landing in Honolulu on an inter island flight. Many say that no trip to Hawaii is complete unless you’ve seen more than one island. Such a trip could include visits to Kauai, Oahu, Maui, Molokai, Lanai and the Big Island of Hawaii. Each island offers its own unique attractions whether they are mountains, coastlines, restaurants, foods, lifestyles, culture and more. Fortunately, there are a number of ways to plan your upcoming multi inter island travel in Hawaii. The easiest way to travel from one island to another is through a carrier that offer Hawaii interisland flights. Such carriers include Hawaiian Airlines, Island Air and Mokulele Airlines. All offer daily scheduled flights. Hawaiian Airlines offers inter island flights to all of the major Hawaiian Islands on an all jet fleet. 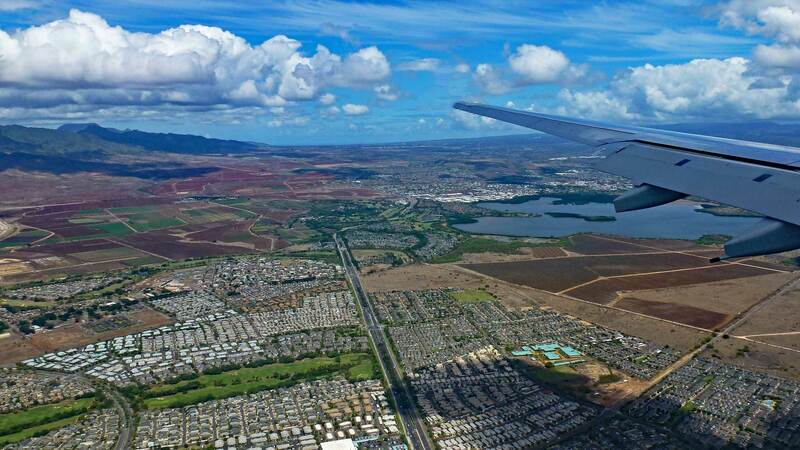 In addition, Hawaiian Airline offers regularly scheduled flights from US mainland and a number of international points. Island Air offers twin engine turboprop service between Oahu, Maui, Kauai and the Big Island of Hawaii. Mokulele offers single engine turboprop services to all the islands including smaller airports not served by the other carriers. This includes areas like Hana, Kapalua and Kamuela. Most inter island flight are very short in duration and the longest flight is only about an hour. All of the carriers offer numerous daily fights throughout the day. So not only are the flights short in duration. But you also have a lot of options for when you want to schedule them. Additionally, the flights are not that expensive and can be as low as $70 one way. One benefit of using Hawaiian Airlines or Island Air is that you can book multi island packages on one itinerary. On the other hand, most other carriers or other online travel websites will require you to book a totally new itinerary for a multi island vacation package leg. Or you will have to separately book the interisland leg directly with the interisland carrier. This website also allows travelers to book multi-island flights and vacation packages on one itinerary. Furthermore, the same is true for any website owned and operated by Panda Travel ®. There are only two passenger ferry boat operators in Hawaii. One carrier, Expeditions, provides daily service between Lahaina, Maui and Manale Harbor on Lanai. While the other carrier, Sea Link of Hawaii, provides service 4 times a week between Lahaina, Maui and Kaunakakai, Molokai.